Here’s a new essay: Splendour in the Art: The Asia Pacific Triennials from 1993 to now. Succumbed to self-indulgence. Was working on a piece that stretched from 1993 to now — originally intended as something publishable, the beast soon split its sides as I got carried away in my own head. Funny how you can teach how-to-write to/for an audience’s (and to a publication’s) needs, for so many years but then cast that practicality aside in the throes of memoir. The result? An essay publishable nowhere but here, I guess. Whacking this blog together on my last 4% of battery (the replacement cord still slithering in transit). Apologies for grammatical infelicities, etc. Similarly, the article could be rewritten as we’re now staring towards the end of the APT9 in 3 weeks, but the priority is just to get the piece up. It’s long. You may not make it to the end, anyway. 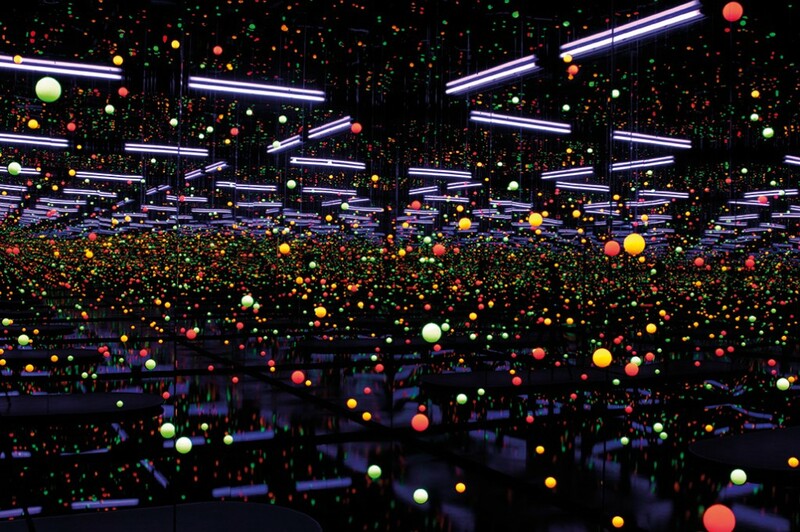 Yayoi Kusama / Japan b.1929 / Soul under the moon 2002 / Mirrors, ultra violet lights, water, plastic, nylon thread, timber, synthetic polymer paint / 340 x 712.1 x 600cm (installed) / The Kenneth and Yasuko Myer Collection of Contemporary Asian Art. Purchased 2002 with funds from Michael Sidney Myer and The Myer Foundation, a project of the Sidney Myer Centenary Celebration 1899–1999, through the Queensland Art Gallery Foundation and The Yayoi Kusama Queensland Art Gallery Foundation Appeal / © Yayoi Kusama, Yayoi Kusama Studio Inc.